It is true though that having natural fence isn’t a fest solution. You have to be patient before the plants will become big enough to start giving you all great hedge advantages but I am sure you will find it worth the wait. Natural fence will serve you better and lest longer than for example wooden one. Think about what is the most important thing to you about the fence in order to take a good decision on which plant to choose. Bamboo is one of the fastest-growing type of grass and is extremely low maintenance. 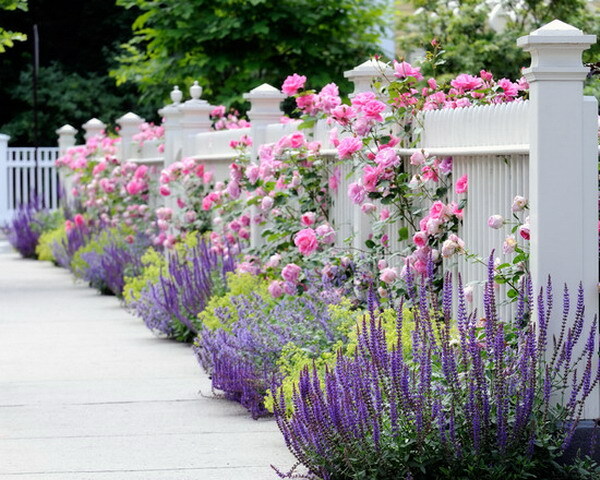 Some varieties can grow incredible high, up to 50 feet so it can serve as an efficient and also good-looking fence. Some bamboo types are very invasive, so be careful which one to choose You can also plant it in a containers to keep it under control. Privet can serve as an effective and very affordable fence. It’s important to consider your needs and space before you decide which type you will choose. Some plants can grow to ten feet or beyond if not regularly pruned. Privet is a relatively fast-grower. When given proper care, it will be between two and three feet higher every year. Evergreen Boxwood can be an excellent choices for a hedge. When you let the plant grow freely, it can sometimes reach twenty feet in hight. Boxwood is often sculpted into some interesting shapes but it’s also beautiful when it is not maintained very strictly. It looks nice even when it is smaller. Arborvitae is not the fastest growing plant but this attractive evergreen tree can make really effective dense fence. It is one of the most popular plants used for borders because it is easy to maintain, it tolerates almost all soil conditions and it can withstand cold. Photinia is often used as a fence. This beautiful evergreen plant with shiny leaves offers nice, sufficient coverage. You should regularly prune Photinia if you want it to stay healthy and keep thriving. It can also grow very tall. Normally it has thorny branches so be careful if you have kids. Cypress trees grow tall and narrow and that is one of the reasons why they make very elegant and attractive fence. This low maintenance evergreen has quite a rapid growth rate around 3.5 feet per year. One of the most popular types is Leyland Cypress but it has rather short lifespan. Skip Laurel plants are extremely durable. They can thrive even in very difficult garden environments and that is the main reason why they are so commonly grown as natural fences. Skip Laurel can grow to 10 feet. When planted into a well-drained soil in a location where there is a lot of sun they will produce beautiful white blooms in spring. Holly is very adaptable to a wide range of a growing conditions. It will grow in tropics and also in temperate zones. Holly plant is a great choice when you want to deter wandering wildlife. Although the plant looks gorgeous it is not that pleasant to touch because of its pointed leaves. You will admire red berries in the fall and winter and white flowers in the spring. Euonymus can be a nice evergreen hedging shrub. It is easy to grow and it comes in many varieties. You will find it in different sizes and colours from green to gold. Eunonymus can tolerate even poor soils and all kind of weather so it can be a really good choice for almost anybody. Juniper is a hardy evergreen with needle-like leaves. It varies in size and shape but some types can grow up to forty feet. It can also live for up to two hundred years. Green flowers will develop into a purple, berry-like cones that are commonly used for flavouring gin.